Sweater Outfits for Men. Everyone stalls out in a style groove once in a while, regardless of whether it’s wearing the same pair of boots all winter or wearing a same pair pants week after week. As I dive into those warm and cozy sweaters, one and only one question that rings a bell is how do I wear them with? The clear answer is what is going to be presented in this article. I have come up with distinctive ways to cuddle a sweater in winter season. Standing out among-st the most pleasing articles of clothing a man can wear is a one class quality sweater the fits in properly. It adds weight to a slim body and streamlines a heavy body figure. Mostly men know minimal about sweaters and even less take full favorable position of the considerable number of styles and examples accessible. To have an understanding about sweater fabric, fit and style you have got to read this article because it hold all kinds tips and tricks about it to help you dress up yourself in the best manner that will reflect your individuality. If you feel like wearing a bomber jacket instead of a cozy sweater then you might want to look here How to Wear Bomber Jacket Men-18 Outfits with Bomber Jackets that contains all the tips and tricks for wearing bomber jacket in the most stylish way in the freezing cold temperature. The word “sweater” is a catch-for an assortment of knitted articles of clothing. In spite of the fact that the term regularly alludes to a pullover, it can likewise allude to a cardigan. There is a great variety of design in any group of sweater that includes necklines, waistlines, sleeve length, cardigan. How to Pick the Right Sweater? Do focus on the material as the choice of material depends on the purpose you want that sweater to perform. If you’re looking for a warm and comfortable sweater for the cold winter days then woolen sweaters would be the best choice. On the other hand, if you’re looking for a sweater to wear in Fall or a light-weight sweater for the beach then cotton ones will best perform this function. Always try a sweater before buying it. This is because unlike shirts, the same size in sweaters can have a completely different look and fitting because of their material. Don’t go for tightly fitted sweaters, instead, it’s better to opt for ones that are slightly on the looser side as sweaters tend to shrink a bit after washing. Moreover, if you decide to layer under your sweater, you would obviously need some space. It’s always better to invest in a few good quality sweaters, even if they are high priced. Rather than a number of low-quality sweaters. This is because a good one will be with you for many years to come, hence acting as a worthy investment. Do keep your skin tone and body shape in mind when choosing your sweater. If you’re an eco-friendly person then opt for sweaters made of natural fibers rather than synthetic one. To make your sweaters last longer, always follow the cleaning instructions that come with it. When storing your sweaters, don’t hang them as this would eventually destroy their shape and fitting. Instead, fold them and store in an air tight bag. 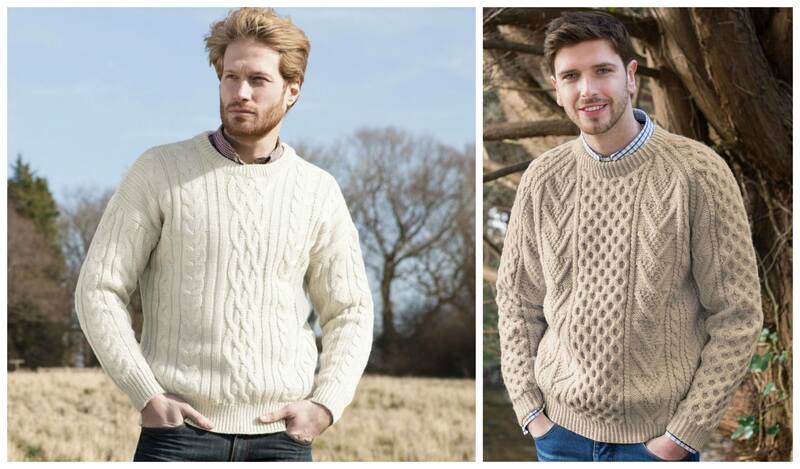 Aran sweaters are a masterpiece with a weave that proclaims the wearer’s faction and history. These sweaters initially filled with the need of keeping a man warm on the vast sea.Regardless of whether you’re sprucing up or going for comfort zone then these sweaters standout amongst the most cozy garment in a man’s closet. Cashmere Sweaters. This fabric originates from goats. Amazingly delicate, lightweight and warm.Each man should have the satisfaction in feeling cashmere against his skin. Wearing this fabric will give you a graceful and a sophisticated look. You can do contrast with the dress pants e.g. white color and you opt for solid plain dark color sweater like red then you would look more fashionable or if its not dark shade as in the photo below then you can opt the same colored dress pants then this look would be a formal one. Cotton Sweaters. Long-lasting, light weight and casual. This is the thing that you wear in the spring and summer to avert the chilling late night. For the most part utilized as a part of easygoing dressing yet can be spruced up properly if done well as done in the photo beneath. Sheep wool. One of the most common sweater fabric, wool that is traditionally favorite when it comes to looks and function. Wool weaved attire was the apparel of normal workers in provincial England; today its proven ability to retain heat, fine hand, and fine hand, and history make it a most loved of men everywhere throughout the world. Wool sweaters do, in any case, require incredible care as they are extremely powerless to get damage from hot running water and rough handling, particularly when wet. Linen Sweaters. Light, breathable, and retains dampness much superior to cotton. Most men are frightful of cloth since it wrinkles, however this is a piece of the fabric saves you form getting cold in a windy weather. Synthetic Sweaters. The latest trend of this year is the sweater made of this material, as this material gives a modern and stylish look to the outfit. From one perspective they are absolute necessities due to the prints and low price yet they are less breathable and less warm, so on the off chance that if you need to make an impression at your work or at indoor parties, then you can wear it and if you need to remain warm and superb, then go for something other than synthetic sweaters. Blended sweaters. Mixing the different materials then make sweaters either lighter and cooler, or heavier and warmer.Blending of different materials like cashmere, silk, and linen will deliver a more refined and delicate product; while mixing of lower end textures like cotton, wool and synthetic will create a rougher, lighter look – it is the mixture of cotton and linen that makes it more of a causal outfit. Now let’s focus on the different sweater styles and how to wear them the right way. 48 years old Daniel Craig is dressed up so smartly that this look will be perfectly fit on you if going on business meeting or some formal gathering. The focal point of the dress is plain solid shade v-neck sweater that is worn with collar shirt , tie, plain black coat, straight jeans , classy wingtips brogue that are a great way to add diversity to your style lastly for complimenting the formal outfit is done by putting on the shades. Note that color theme was lighter from beneath and getting darker while moving toward the outer garments. The crew-neck highlights a great round neck neckline. This current sweater’s outline permits it to sit around the base of the wearer’s neck, giving a spotless complete that suits all body shapes. The neck area of the sweater is generally a different piece. It is an easygoing Outfit. You can wear a crew-neck all alone or with a T-shirt. Contingent upon the search you’re going for, you can have the shirt on show or covered up. Mostly when thinking about turtle necks these things pop up a pipe smoke, scratchy neck or suit. But we cannot blame our self for this. Now it’s time to put these assumption’s on one side and go for a makeover. We cherish that a decent turtleneck is sufficiently easygoing for a night out, additionally spruced up enough to get you through shirt-and-tie clothing regulation. Like most v-neck, however deficient with regards to sleeves, sweater vests make an awesome layering alternative for suits as shown in the pictures below these vests give you a more descent look regardless of the pattern on it. You can wear it with a tie or a bow or none. It’s always a great idea to wear these sweaters with blazers or suits and this is why they look great as a wedding guest outfit as well. Commonly found in cardigans range, however can be seen in different outfit wear from sportswear to official wear as shown in the photo below also. Wear it calmly, spruced up, or for solace as a substitution for a hoodie. Going on Christmas holidays then this Shawl collar sweater will do the look more stylish and classy. These sleeves are opposite of set in sleeve as they are sewed with one nonstop fabric no separate piece is used for sleeves only for the neck. If you want to have a professional look then you might want to go for these sleeves otherwise to go on some friends party then you can opt for set in sleeves. A sleeve that is sewn onto the body, two separate pieces of the same fabric are sewed together. Set in sleeves require expertise’s as a result of the utilization of creases and additional sewing. A strong shaded sweater is presumably the best, particularly if the coat has some kind of pattern on it therefore if planning to wear a coat or jacket over it then take in account that the shades and patterns don’t conflict. The example of shades work best here, particularly on the grounds that it’s to some degree a formal outfit as in the pictures shown. Simple solids pattern are the most formal, with examples, regardless of whether woven in or sewed, making the article of clothing more easy-going. Argyle standouts among-st the most mainstream sweater designs seen on men in the winter months. The secret of wearing an argyle sweater effectively is to comprehend that the sweater’s pattern should be the focal point of your outfit. Coordinate it with basic things that don’t rival it; likewise, know it that it should be worn two or three times each month. By the end of a long autumn day, curling up in a chunky knit sweater and reading one of my favorite books. Aside from their ability to make me feel my coziest, sweaters are also a staple piece in any wardrobe, especially during the fall and winter. Round neck sweaters are best for college guys and if you have a striped one then that’s even better. Wear it with chinos for a stylish and sophisticated look. 61 year old actor Bruce Willis shows off a cool and casual look by layering his sweater with a scarf and jacket. 36 year old Ryan Gosling loves wearing deep V-neck knitted cardigan sweaters and always styles them to perfection. For casual wear this year, nothing beats adidas superstar sneakers. When it comes to dress shoes, amongst all the trending shoes, leather brogues will definitely be the best choice. Have a look at this stylish attire with leather brogues. For a clean and polished weekend look, especially one that you’ll be spending on a date – wear your hair sideways with a nice trimmed beard. David Beckham is undoubtedly one of the most stylish men around and we love this 2017 look of his which is all about being cozy in a sweater. He’s wearing the very classic pieces: a turtleneck sweater, relaxed fit trousers and high top sneakers with black sunglasses and yet the way he’s carrying it with style and confidence, he takes these simple pieces to a whole new level.